What more could you ask for? Our new chickens have arrived and settling in despite the wind and rain. It wont be long before we have more nutrient dense eggs available. The rain has been wonderful but our girls are saying enough is enough. With glorious sunrises like this one its only a matter of time before the warm sunny days are upon us again. A picture tells a thousand words. 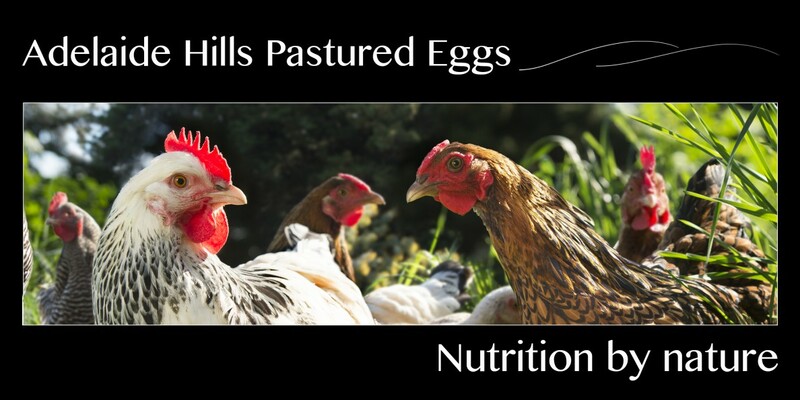 At Adelaide Hills Pastured Eggs our Chickens roam nutrient dense pastures 24/7. They get to express themselves as only chickens can. Whether it is scratching for bugs, climbing on branches and trees, eating grasses legumes or herbs or providing us with yummy eggs a chicken should be free to do whatever she wants. Our girls love the fact they are protected by Tom & Ruby and our two Maremma’s are often seen on reconnaissance patrols or on top of a hill watching and observing from a distance. No cages or Barns here, its pasture and the freedom to roam. Its simply Nutrition by nature. Adelaide Hills Pastured Eggs is one of 3 SA egg producers with less than 100 hens per Ha. This is a long way short of the allowed 10,000 hens per Ha. Most if not all small producers are lobbying for a new gold standard so that our eggs are sold with a point of difference rather than “crammed in like sardines” free range egg producers with stocking densities closer to 10,000. I personally think 10,000 would be like living your entire life at a rock concert, noisy and over crowded. At significantly lower stocking rates (we are at 30 hens per Ha) the hens have the freedom to express themselves as nature intended, they can dust bathe, scratch and search to seeds, bugs and green grass. Our hens live permanently on pasture and so we think the new gold standard should be “Pastured” eggs. At Adelaide Hills Pastured eggs we pride ourselves on being sustainable and regenerative farmers offering exquisite tasting eggs. Its simply Nutrition by nature. It appears the consumer lucks out again when they go and buy Free Range eggs after the decision to make 10,000 hens per hectare the new standard for Free Range Eggs. RSPCA on their website have questioned the meaning of ‘meaningful and regular access’. Consumers will be paying an increased price for something that is effectively a barn or caged egg. Here at Adelaide Hills Pastured Eggs we are submitting a proposal to create a new category of eggs. Pastured eggs should become the new gold standard for premium quality eggs. We feel restricted as legislation makes us use the term “free range” on our cartons and after the recent decision we want nothing but to distance ourselves as far from free rnage as possible as the term has now been “bastardized.” Consumers need a “meaningful” choice so they can make an informed decision as to the quality of the eggs they are buying. What the new legislation has achieved is brought the term free range eggs down to the level of caged and barn laid quality. Egg producers can use the term free range whether a hen physically goes outside the barn or not. Eggs are in the news this week with speculation as to what is and what isn’t a “free range egg”. Seems the dispute is over how many hens can be confined into a specific sized area. Free Range could mean 1500 hens per Hectare or as many as 10,000 hens per hectare. Here at Adelaide Hills Pastured Eggs we have approximately 30 hens per hectare, that’s right 30. So our “stocking rate is by “free range” standards, ridiculously low. We don’t consider stocking rate to be relevant but rather its the ability of our chickens to be able to move to new pasture and allow the area they were on to regenerate. This is truly sustainable and makes for good practical farming. Our hens thrive on new bio diverse pastures and produce exquisite tasting eggs. Hence the reason we use the term “pastured” so you know our eggs come from a truly sustainable system. Unfortunately we have to by law have the words “free range” on our egg cartons but with the way the term is used we’d prefer to use the term pastured. So if you are looking for exquisite tasting eggs then perhaps try ours, once you have had an Adelaide Hills Pastured Egg, there is no going back! Its simply nutrition by nature. I might be wrong but I think this is the Same Chicken? Mt Barker Fresh Markets on board! Stirling Fruit Mart now Stocking Pastured Eggs!